The photographs showing U.S. Secretary of State John Kerry smiling and slapping palms with Russian Foreign Minister Sergei Lavrov are being circulated by many Syrians opposed to the Bashar al-Assad's regime as visual obituaries of their cause. Weren't these men supposed to be on opposite sides of the Syrian conflict? And why does the Herman Munster-ish Lavrov look happier than his American counterpart? Perhaps because the atmospherics of Kerry's recent visit to Moscow were meant to show that his hosts were under no illusions as to who was the more desperate and bowed party. First, Kerry's motorcade sat in Moscow traffic for a half hour because of a military parade rehearsal for Victory Day, which celebrates the Soviet defeat of the Nazis in World War II. Then Russian President Vladimir Putin kept Kerry waiting for three hours before granting him an audience, upon which he fiddled with his pen and more resembled a man indulging a long-ago scheduled visit from the cultural attaché of Papua New Guinea than participating in an urgent summit with America's top diplomat. The pro-Kremlin newspaper Izvestia claimed that Kerry had been "counting on convincing Moscow not to block sanctions against Damascus. It didn't work." Even if false, the framing of the story provides good insight into how the Russian government viewed these talks. And in the end, Kerry gave Putin exactly what he wanted: Washington's assent to a renewed push for negotiations to end the geopolitical catastrophe in Syria. Sometime before May is behind us, the United States and Russia will host a conference based on the parameters of the Geneva Protocol, which was agreed to late June 2012 under the auspices of the United Nations. The communiqué calls for a "Syrian-led political process leading to a transition that meets the legitimate aspirations of the Syrian people." To pave the way such an agreement, the document demands the end to armed violence by both sides, the release of political prisoners, granting journalists freedom of movement throughout the country, and the "[c]onsolidation of full calm and stability." Since this would-be roadmap was cobbled together almost a year ago, more than 50,000 Syrians have died in the Assad regime's desperate attempt to crush the uprising. The underlying assumptions are that Russia can "produce" Assad or his representatives, pressuring them to attend this confab, and that the United States can produce both the political and military wings of the Syrian opposition with which it has chosen to partner, namely the Syrian National Coalition and the Free Syrian Army's Supreme Military Command, headed by Gen. Salim Idris. Neither of the latter bodies existed when the Geneva Protocol was first introduced, and Idris now finds himself forced to do what Russia's clients in this conflict never have to do -- beg. Indeed, while Assad imports long-range missiles from Iran and allows Islamic Revolutionary Guard Corps commander Maj. Gen. Qasem Soleimani to build a 150,000-strong sectarian militia to inherit the responsibilities of the Syrian military, Idriss is writing open letters to his patron asking for more help. The U.S. response is to ask Idriss men to kill al Qaeda-linked Jabhat al-Nusra fighters first, and only then turn their attention back to President Bashar al-Assad's forces. Syria has allegedly been subjected to sarin gas attacks, seen the deaths of more than 70,000 people and the displacement of nearly a quarter of its entire population, and become a haven for a growing and ambitious al Qaeda franchise. Now Kerry wants the world to believe that it can travel back in time and revive a diplomatic initiative that was stillborn even at the time. It's not going to work. As the Russians like to remind the world, nowhere in the Geneva Protocol is there a demand that Assad must resign or even promise not to take power again in future. John Kerry appears to agree: In a joint press conference in Moscow with Russian Foreign Minister Sergei Lavrov, the secretary of state offered this stark reappraisal of President Barack Obama's repeated insistence that Assad quit the scene. "[I]t's impossible for me as an individual to understand how Syria could possibly be governed in the future by the man who has committed the things that we know have taken place," he said. "But ... I'm not going to decide that tonight, and I'm not going to decide that in the end." Kerry was forced to hastily repudiate his wishy-washiness in Rome by reminding reporters of the original U.S. stance. But his initial response may convince the Russians that the U.S. position on Assad's departure is negotiable. Kerry's comment about Assad's future mirrored Obama's now-notorious "red line" on the use or mobilization of chemical weapons. After the White House admitted that Assad likely used chemical weapons against his own people -- a step that Obama once said would be a "grave mistake" -- America's next diplomatic move on Syria was this effort to revive moribund peace talks. All this is taking place against more caffeinated legislative efforts to assist the opposition. Sen. Robert Menendez (R-NJ) introduced a bill on May 6 that would provide U.S. arms and military training to vetted rebels, and Sen. John McCain (R-AZ) and Sen. Carl Levin (D-MI) took to the floor today calling for precision air strikes using stand-off systems on Assad's aircraft and missile launchers. What the Kremlin correctly gleans from such schizophrenic shifts in U.S. policy and rhetoric is that Washington hasn't got a coherent strategy to speak of. And the Putinists surely won't have missed this tucked-away quote from an unnamed U.S. official: "If [Assad] drops sarin gas on his own people, what's that got to do with us?" Russian security officials will read that as an open invitation to Russia to assist the White House in putting off intervention in Syria. Already, they've been all too happy to oblige: A day after Kerry left Moscow, the Wall Street Journal reported on an "imminent" deal between Russia and Syria to furnish Assad with S-300 missiles -- the same high-tech, anti-aircraft system that Washington pressured Russia not to sell to Iran. The supposed package will include "six launchers and 144 missiles, each with a range of 125 miles," and the first delivery is scheduled to occur within the next three months. Such weapons would no doubt boost the argument of non-interventionists in Washington who contend that Syria's air defenses are too formidable to impose a no-fly zone. Putin's mind lies open like a drawer of knives, yet the United States -- and even some members of the Syrian opposition -- persist in the illusion that the Russian leader can change. 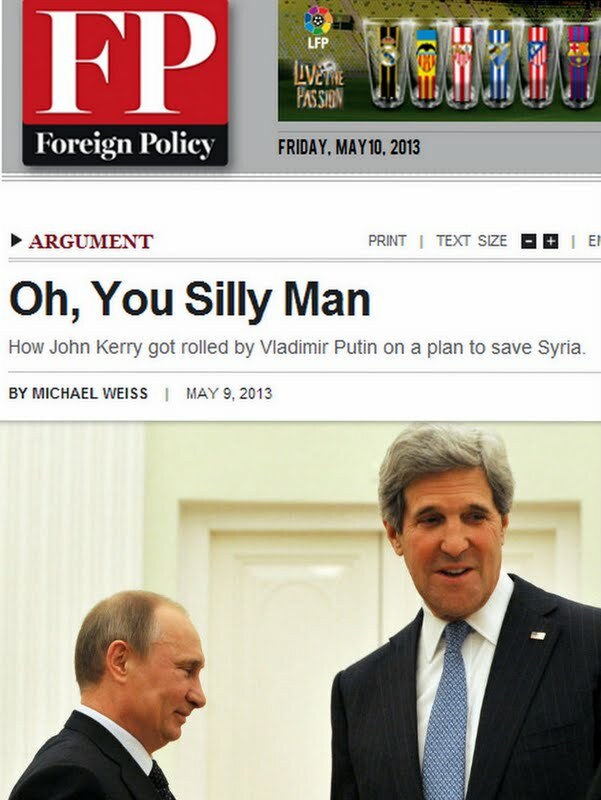 But why should he, when it's the West's position on Syria that's proven eminently mutable? Lavrov wasn't being glib or unscripted himself when, in an interview with Foreign Policy, he said that he was "gratified to note some positive change which occurred on the part of those who have been denying any possibility for a dialogue as long as President Assad is in Syria." Lavrov then reiterated Russia's right to sell arms and anti-aircraft weaponry to Assad, and noted that it was the Americans, not the Russians, who were backing down on their demands. Fyodor Lukyanov was similarly correct in his assessment in al-Monitor on Thursday: "Russia's position is certainly not changing.... Rather, it is the US that is refining its point of view -- not due to Russia, but as enthusiasm wanes regarding what Syria might look like after Syrian President Bashar al-Assad leaves." From the beginning, the Russian strategy has tracked well with that of the Assad regime's: prolong the conflict to the point where jihadists are the most visible presence on the other side, then frame it in the grammar of the global war on terror. Taking a page from Assad's book, Russia has characterized all of Syria's rebels -- including recent military defectors from the regime -- as "terrorists." It has tried to lay the blame for the Houla massacre -- in which 108 civilians, including many women and children, were butchered by pro-regime shabiha -- on the opposition. It has facilitated the regime's propaganda about the rebels' use of chemical weapons by insisting that the United Nations restrict its forensic investigation to just one area in Aleppo, rather than allowing the U.N. team to launch a full investigation across the country. Russia is also aware that the United Nations cannot access Syrian territory without Assad's permission, which is as unforthcoming as it is convenient for those who believe that no amount of credible or "concrete" U.S. intelligence on weapons of mass destruction will be taken seriously after Iraq. Lavrov was certainly right to say that Russia's position has been "consistent." Now compare this to the White House, which first established a policy of regime change when Obama said that Assad had to "step aside" in August 2011 -- only to then quietly rescind that policy by backing former U.N. Syria envoy Kofi Annan's failed six-point peace plan in March 2012. One almost envies the Kremlin at this late hour. After much intransigence at Turtle Bay and a steady stream of arms shipments and military advisers to the Assad regime, Putin finds that his expectations for restoring Russia's great power status have actually been exceeded. He wanted to be equal to the United States in foreign affairs, but on Syria, he's clearly now the man to see. Happy Victory Day.